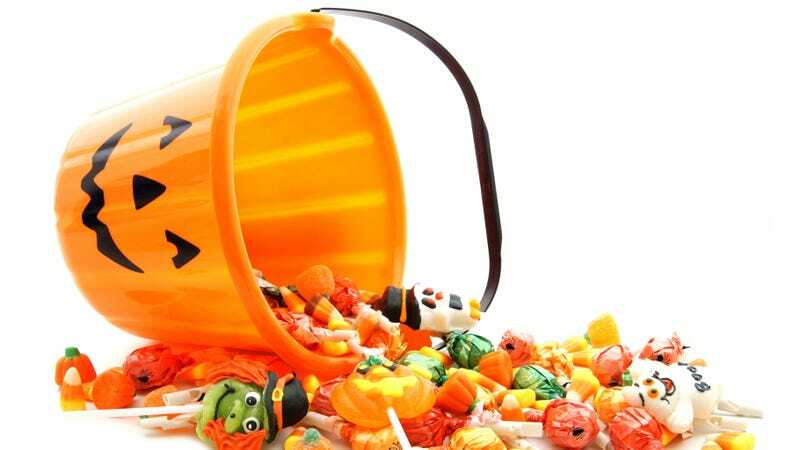 What’s the weirdest thing that showed up in your kid’s trick-or-treat bucket this year? Sad, right? My friend called out that three kids were approaching, and you have to be a stronger person than me than to slam the trick-or-treat door right in kids’ faces. So after running through a variety of unacceptable options in my head (excess socks? cans of tuna? spices from my husband’s vast collection? ), I remembered my son’s candy stash that I had confiscated to my closet after he broke a piñata at a block party last month. I grabbed fistfuls of Airheads and Skittles when my friend yelled, “There’s four more!” Somehow we scraped together enough to feed our final visitors for the night, then mercifully turned off the light (the traditional “we are out of candy” Halloween signal). Over at a nearby house, my neighbor was carting around a cardboard box full of light bulbs and Cheetos bags from Costco. He shrugged, “We ran out about an hour ago.” I’m sure he didn’t actually hand out any lightbulbs, but hey, desperate times. So I was not surprised to see posts on Twitter today about random, bizarre things found in children’s trick-or-treat takes, from loose change to comic books. Sure, some parents are trying to sway away from sugar, leading to stickers or tattoos or cute, tiny bears. Some even hand out toothbrushes and toothpaste in an effort to stave off childhood tooth decay. What about your stash? Anything unusual? Please let us know in the comments!